Saffron Tree: Possum Magic - An Australian Classic! 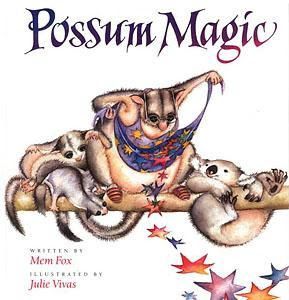 Possum Magic - An Australian Classic! As far as Australian picture books go, no doubt, Possum Magic, is the most popular one from the island continent. Mem Fox is a renowned Australian author and through her books, she tells a story like no other. Without further ado, let me get started with my review. deep in the Australian bush lived two possums. Their names were Hush and Grandma Poss. Indeed, a delightful start that sure enough got my kids glued to the couch for a read-aloud session. I personally loved the use of “but not very long ago” – I could hear the magic of Mem Fox’s story-telling, popping out of the book, right away. And best of all, she knows how to get the attention of children. Ok, let’s move on. Wonder what the magic is all about? It so happens that Grandma Poss knows how to do bush magic! She makes wombats turn blue and Kookaburras pink. She even makes emus shrink! Well, the humor and fun have just begun. Of all her magic, the best one is making Hush, grand-little possum….. invisible! It gets even better - you see invisible “Hush” ( my children loved the way the illustrator portrayed “invisible” Hush……….with dotted lines!) sliding down from kangaroos and getting squashed by Koalas. And then, you find out why Grandma makes Hush invisible. She wants her grand-little-possum to be safe from snakes. Of course! What happens next? Hush, tired of being invisible, asks Grandma Poss if she can make her visible again. But, Grandma Poss doesn’t know how to undo the magic. She reads all her magic books. But the magic to make someone visible is not to be found anywhere. What will she do? Grandma Poss figures it has to do something with food – people food! They decide to leave the bush. Grandma Poss on her bicycle (even has a rattan basket attached to the handlebar - love those!) and with Hush on her back, are off to Adelaide to eat Anzac biscuits, Melbourne to eat Minties. Nothing seems to help Possum. She is still invisible. Off they go from one city to another in Australian exploring one local food after another! Does Hush become visible again? What do they eat next? Where do they go? Discover the regional foods from down under that help Hush become visible again. In the very end, there is a page that carries a map of Australia, the different cities where Grandma and Hush travel, and a glossary of all the foods of Australia they discover through their magical journey. Possum Magic is an entertaining, informative and one delicious picture book giving us little bit of everything - magic, Australian animals, cities in Austrlia and their local foods. Offer it to preschoolers and you will see them rollickingly take in Possum Magic for its enchanting appeal and happy-ending. Many thanks to Mem Fox and Julie Vivas for Possum Magic! Please click on the following, if you are interested in reading more on Mem Fox and Possum Magic! I love love the sound of this book. Put unfamiliar animals, foods and names into one vividly illustrated book with rhyming words and there you go - a great read ! Thanks Praba for this wonderful link. Yes I liked this one, and the Wind in The Willows is another one of my favourites. nice review. the cover art is pretty cool!! Sounds like a cheery book, with details about the continent...neat! When I see certain author names, I blindly pick up the book. Mem Fox is in my favs list. What a fantastic book - it seems to have the right mix of all the elements - information and fantasy !! Thanks for this wonderful pick and a great review Praba ! Another wonderful pick, it sounds like! You know I am partial to rhyming text, Praba, and now all these other interesting elements? Have to check it out. Thanks! invisibility, traveling, map, Mem Fox. this will be loved over here, for sure.